This picture took quiite a while, though it was probably finishing it up that took the longest... I've been fiddling with all the opacities and contrasts and whatnot for days T_T It's probably not taken as long as Kasmir though; there was much less hand painting involved (Though there was some!) I DID have to cut the coral reef out using the pen tool though, and since that's basically just constant clicking, my wrist absolutely killed after doing that. I think that's the longest time I've ever spent cutting something as well, the reef took close to an hour to do T_T AND the reef was seriously the bane of my existence when I was doing final touchups... I have never used the burn/dodge tools so much in my life. Ouah It's so beautiful :0 ! I love this ! I don't know what to say. I read how much effort you put into making this- and in my opinion it's worth every second. The longer I look at it, the more shadows appear in the background, the more details I discover. It seems like I see the horse underwater from a window of a submarine. It must be one of the most stunning manips I've ever seen, and it's a pity you can't continue your work now. Aww that's such a lovely comment, thank you so much! I'm glad you like my work, this is still my favourite piece that I've made, even after all these years I do think about getting back into manipping again sometimes but I sadly don't have the time, and having been out of practice for years, I don't think it would be the same XD But thanks again for such wonderful words, you just made my day! Who knows, maybe you'll have some time in the future and could start again (if you'd like to), maybe you won't. 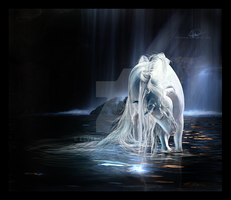 This is truly my all-time favourite picture of a horse in water <3 You are so talented! It's officially, I am no longer depressed! If you truly, you know-- I don't know... tried to developed your skill (in your spare time), I'm sure you would be amongst the best graphic artists in the world. No joke! Thank you SO much for telling me about it though, I really appreciate it! The owner of the forum has removed it, I noticed when I got on :3 haha. You're welcome! I would like to inform you that someone stole this piece for a contest on howrse. No problem, i really hate art theft. Oh, ok. yeah she took it down. Its all good. Aww, thank you! I'm glad you like it! Oh gosh, this is too amazing for me to express it. The Ponybox.com community would love a amazing equine artist like you. (: We are all horse lovers who are always looking for honest, friendly new players. Hope you join us! I love horses. I prefer them as a sign of beauty, grace, elegance, and fearlessness. I only add deviations that include horses to my favorites, and congrats, this deviation is my first one and will stay! I only pick 0-2 favorites anyways. Beautiful work! What colors! Gorgeous! This is gorgeous! Amazing work, the emotion factor in this is almost startling! Anytime! And you wouldn't like this?! Agh, excuse my typo, I meant to say, "who wouldn't like this?!" Aww thanks, I'm glad you like it!